After the deaths of Jerry Garcia, Timothy Leary, and Ken Kesey, it appeared that the psychedelic revolution of the 1960s had finally been suppressed. But the opposite was occurring, evident in the popularity of transformational festivals like Burning Man and BOOM!, the media coverage of ayahuasca use, and the growing number of celebrities and Silicon Valley billionaires readily admitting the benefits of microdosing. Along with the return of university research, the revival of psychedelic philosophy, and the increasing popularity of Visionary Art, these changes signify a widespread psychedelic cultural revolution. 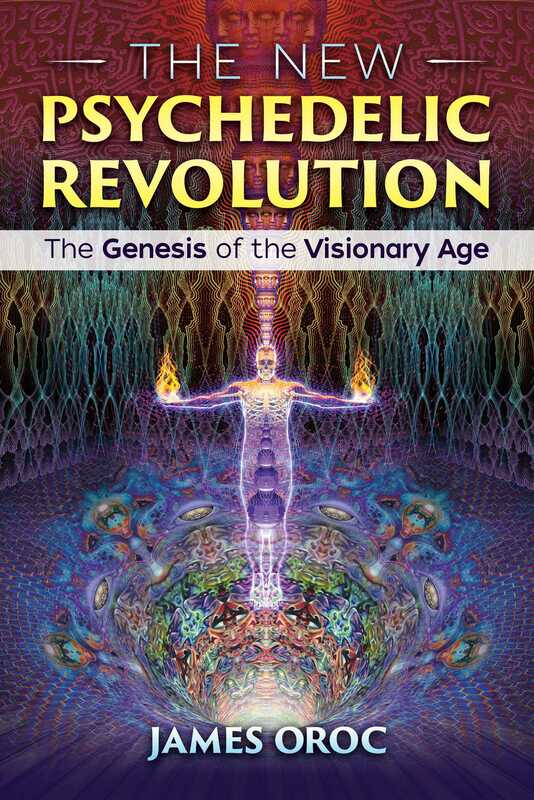 Speaking from the forefront of this new revolution, James Oroc explores 21st-century psychedelic culture through three of its main post-1960s architects: chemist Alexander “Sasha” Shulgin, mycologist-philosopher Terence McKenna, and visionary artist Alex Grey. Examining their work in depth, he also explores the work of DMT researcher Rick Strassman, MAPS founder Rick Doblin, consciousness researcher Stanislav Grof, author Daniel Pinchbeck, and new visionary artists such as Amanda Sage and Android Jones. He investigates the use of microdosing in extreme sports and the transformed understanding of spirituality that arises from the psy-trance festival experience. He presents a “History of Visionary Art” from its roots in prehistory and antiquity, to Ernst Fuchs and the Vienna School of the Fantastic, to contemporary psychedelic art and its importance to visionary culture. The author explains how psychedelics are powerful tools to examine the Ego and the Shadow and induce transpersonal experiences. Building on anthropological evidence for the role of plant-entheogens in the development of human culture, he proposes that our ongoing psychedelic revolution is seeding the beginnings of a new Visionary Age. For those unfamiliar with the effects of psychedelics (or more specifically of LSD and psilocybin mushrooms) at a wide range of dosages, the title of this chapter may seem like an obvious contradiction--for what connection could there possibly be between these infamous “hallucinatory” compounds and the obviously highly coordinated physical pursuit of the unfortunately named “extreme sports”? Based on the tangled reputation that LSD has had since the mid-1960s it would seem impossible to believe that various experienced individuals have climbed some of the hardest big walls in Yosemite, heli-skied first descents off Alaskan peaks, 3 competed in world-class snow-boarding competitions, raced moto-cross bikes, surfed enormous Hawaiian waves, flown hang-gliders above 18,00 feet, or climbed remote peaks in the Rockies, the Alps, the Andes, and even above 8,000 meters in the Himalayas--all while under the influence of LSD. However in the often outlaw underground culture of extreme sports, the use of LSD or psilocybin mushrooms while skiing, snowboarding, mountain-biking, surfing, skateboarding, and so on, is in fact common throughout North American ski-and-sports towns, where they enjoy an almost sacred reputation. According to the legends of this tight-knit underground, many incredible feats have been accomplished by modern extreme-athletes whilst under the influence of psychedelics--a fact, which for obvious reasons, generally never gets recorded in the record books. The reason for this radical disparity between the popular perception about the disabling effects of psychedelics and their apparent common usage amongst the fringes of the extreme sports community is mostly a matter of dosage and historical familiarity. LSD is extraordinarily potent, effective on the human physiology in the millionths of grams (μg), and very small differences in dosage can lead to dramatically different effects. In the first decade of LSD research it was commonly known and accepted that there was a wide-range of “LSD intoxication” that occurred across the range of dosage (20μg –1500μg+), with only the mid-tohigher dosages producing what became known as “psychedelic” effects. At the lower dosages, a state known as “psycholotic” was also recognized, where in many cases cognitive functioning, emotional balance, and physical stamina were actually found to be improved. This recognition of the varying effects of LSD was lost after the popular media demonized LSD with the help of the various myths and excesses of the ’60s “Love Generation.” When LSD made the jump from the clinic to the underground, its early explorers were 4 universally fascinated with the higher dosage entheogenic experience, while the more subtle effects at lower dosages were largely forgotten or ignored. The first “street” LSD in the 1960s was thus generally between 250μg and 500μg, a potency powerful enough to guarantee the casual user a truly psychedelic experience. LSD is somewhat unusual however in that a user can build a fast tolerance to the compound after regular (daily use), and while one’s initial experiences on even a single dose can be dramatic, before long veteran “acid-heads” may be increasing their own dosage ten-fold--thus requiring much stronger hits than the average user. It was the high dosage of this early street acid, in combination with the complete ignorance of its early users, that would be responsible for the high number of “acid-casualties” that gave LSD is fearsome reputation. However, by the 1980s both Deadheads and the Acid-House generation had realized to drop the dosage of street acid to between 100-125 μg. These days a hit may be as low as 50 μg … or as little as 10 percent as powerful as a hit of 1960s acid, which is a dosage well below the true psychedelic threshold for most people and, for an experienced user suitably inclined, can certainly fall within the psycholotic category. There was always a strong contingent of experienced psychedelic users among the extreme sports community due to the little realized fact that the seeds of the extreme sports revolution were actually planted with the dismantling and dispersal of Psychedelic Culture in the late 1960s and early 1970s. As countless numbers of counter-culture refuges left the major cities and moved out to small towns in the country in the Back-to-the-Land movement, most were looking for new paths to fulfillment after the spectacular promises of the brief Psychedelic Age had failed and a new age of uppers and downers was emerging. At the same time as this sudden influx of these “freaks” to the beaches, deserts, and mountains of the world, technological advances in minor cult-like sports were suddenly allowing ordinary individuals unprecedented access to the wildernesses of the world--in the mountains, the ocean, and even the air--as a new kind of athlete took the concept of “finding oneself in the wilds” to a whole new definition. The invention of these highly individualistic sports (such as surfing, skateboarding, snowboarding, BASE jumping, tow-in surfing) that sought to use existing terrain in new and inventive ways generally raised the ire of the status quo, and so most extremesports begin life as “outlaw sports” of some kind or another, with their participants regarded as rebels. The attraction of these types of sports for the newly arrived psychedelic-era refugees is obvious, and most of the leading figures of this era were clearly cultural rebels living well outside of the norms of society. For this particular branch of the psychedelic tree, the oceans, deserts, and great mountains of the world were now being recognized as the ultimate “set and setting”--a realization common to mystics and sadhus since the beginning of recorded time.